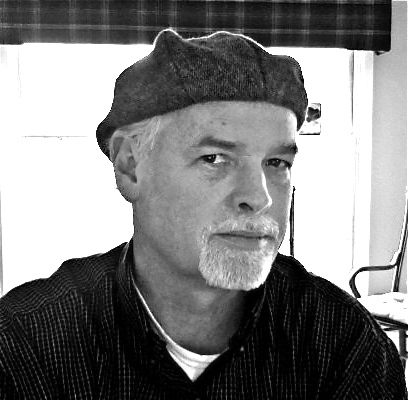 David James’ poem “A Man Tries Not to Die” appears in Midwestern Gothic Issue 4, out now. I wrote my first poem about 40 years ago as a sophomore in high school after my girlfriend dumped me. It was a pining love poem and I wrote dozens of them (all since burned). But I got hooked on the act of purging my emotions and ideas onto the page. Even so, when I left for Western Michigan University, I was a physics major, math minor. After taking a creative writing course from Stu Dybek, I decided to pursue writing, much to the dismay of my parents. They’ve since forgiven me. I was born, raised, went to school, and worked in Michigan my whole life. I am the Midwest. The landscape and mentality of the Midwest is all I know. It’s infused in me. The physical elements of the area—the lakes, fields, flatness, hawks, woods—find their way into almost every poem. I’ve personally found that our region, brilliantly coined “the third coast,” is perfect for writers for two reasons. One, the pronounced seasons bring a new flood of writing every year—the first snow, the leaves falling, the tulips rising, the ringing of a heat bug. It would be hard for me to live in a state with muted seasons. And two, as writers here, we’re isolated. We’re left to drift on our own, away from the trends and fashions often found on the east and west coasts. That’s a good thing. We’re left to find our own voice and polish it. As Midwesterners, we’re too nice and humble; it’s a regional trait. We wouldn’t presume to believe our work was more important or representative of the country than any other area. If Midwesterners have a tragic flaw, it’s humility. Social media excites and frightens me in equal amounts. I publish in online ezines and have a Facebook presence. Does that help me as a writer? I doubt it. Writing is a solitary practice. I need stillness, quiet, time to think, ponder and imagine. Social media cannot help me with any of those things; in fact, social media is a temptress, luring me away from a sustained focus on my work. Sure, the internet might be able to get me a wider audience and some book sales, but I’m not savvy enough to have accomplished either. My longing is to write deeply, not to post that I just stepped out of the shower and hit my big toe. This is an impossible question, so I’ll do this: here are a few authors whose work continually draws me in. In fiction, John Irving, Annie Proulx, and Julio Cortazar. In drama, Samuel Beckett, Eugene Ionesco, and Ed Albee. In poetry, James Wright, Richard Hugo, Anne Sexton, James Tate, Galway Kinnell, and Pablo Neruda. I’m a breakfast man (eggs, hash browns, toast) when it comes to food, and I absolutely love corned-beef hash. I’d have several pints of Guinness with Samuel Beckett. I view him as one of the Picasso’s of the literary world, someone who dared to take writing and drama into a completely new direction, fueled by his own unique imagination. I want to know how he had the courage or stubbornness to do that.